The smiling visage of Johnny Heisman now stares out over Times Square, New York. Texas A&M’s archaic marketing department has really changed since Jason Cook came on board. Dear University of Oregon, you stick a billboard in Times Square after your quarterback wins the Heisman. It has been a heady ride for the young man from Kerrville, Texas. In the spring he seem destined for the role of backup. In the summer an arrest for flashing a fake id to a police officer suggested that his days in College Station were numbered. But he persevered, working on his game with a QB coach in California. His improvement as a passer in fall practices and the realization by his coaches that this kid had “IT” got him the starting job. Manziel showed flashes of his skills in an opening season loss to Florida. As teams ganged up to stop the run he increasingly beat them with the pass. To that he added his own particular brand of sandlot improvisation along with some darn good luck. Video below. Now a delighted (and relieved) Aggieland revels in its second Heisman trophy winner (the last 55 years ago) as the cherry on the icing of an unexpectedly successful inaugural season in the Southeastern Conference. Manziel returns home to prepare for Oklahoma in the Cotton Bowl and the rest of his college career with a giant bulls eye on his back. He will also get his own bill board on Broadway. 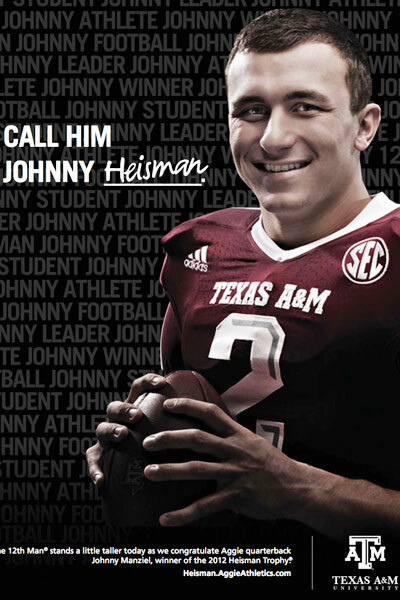 Congratulations Johnny Football…I mean Johnny Heisman.